- my freckles have returned, after a multi-year hiatus. I rather like them actually, and far prefer freckles over melanoma as the consequence of forgetting to bring a hat to the baseball game. - if you take the shortcut when walking home from the video store, it will actually take you 10 minutes longer. At least the route that I took. - it's been two weeks since I forgot my reading glasses at the hotel. The only reason I am going to pick them up today is that they were expensive. Let's hear it for cataract surgery and expensive reading glasses gathering dust in a drawer. 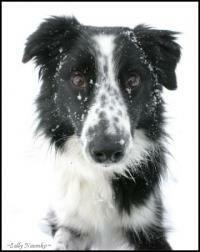 Unfair showing a picture of a cute dog with snow on his nose. It's 32 degrees out. I take it back! I take it back! Here's hoping your eyes can relax now. 1. You look adorable with freckles. I have them too, along with the furry face. 2. I've found that longcuts are often shorter than the shortcuts are long. 3. Why did you have your expensive reading glasses at the hotel in the first place? 32! I didn't know it got that hot on the coast, Al. It should be just about perfect then, when we get out there in September. Unless it snows. We must be twins then, Charlie. I've always wanted an evil twin. Oh those stupid glasses - I foolishly thought I might need them. As for why get expensive ones, I blame the evil optometrist for upselling me. Freckles are always preferable to melanoma and zits too. I can't believe I'm almost 48 and still get them! I could be mistaken but I thought the freckles that come out after sun exposure were actually skin damage? Next time you should take your GPS on the walk. I too have expensive reading glasses. I originally got progressive lenses (a kind way of saying old people glasses)for a gazillion dollars, the bottom for reading and the top clear, but they made me nauseous. I had the lenses changed to just reading glasses for only half a gazillion dollars.....some days I even know where thwy are. I think I really do need some zombie statuary for my garden, Kelly. Everything in there is dead anyway. I hear you on the progressive lenses. These expensive readers are supposedly progressive readers, if you can imagine, the bottom for printed material, the top for computer work. Serious ripoff!